APPLES WITH BLOSSOM AND LEAVES. DMC LANARTE LIFE STYLE COLLECTION EMBROIDERY KIT NUMBER 34281. TOADSTOOLS WITH CORN AND CONKERS. YELLOW AND BLUE FLORAL WITH BUTTERFLIES. Cross stitch Kit by DMC “Patchwork “. New counted cross stitch kit. High quality 100% Cotton colourfast embroidery skeins in a full set of 447 non-duplicated colours. Each skein is 8m (8.7 yards) long and individually tied. 447x Thread floss mix color. Colours: Color will select in random but will not repeat. Kit contains Zweigart 16 count Aida fabric, DMC stranded cotton threads, sorting cards to put the threads on, a needle and easy to follow instructions. The project has not been started. Traditional wedding cross-stitch picture from DMC. The wedding dresses are based on Victorian designs held in the Collection of the Harris Museum and Art Gallery, Preston, England. The kit requires a high level of needlework skill (graded advanced by DMC). Rather old but unopened (SEALED)DMC Floral Collection counted cross stitch kit:-"Harvest Festival". DMC Blackwork flower collection kit BK1354 - sealed. Condition is New. Dispatched with Royal Mail 2nd Class. No K 4980. DMC Treads. COUNTED CROSS STITCH KIT. Contains 100 % 16 count Cotton Aida. BL1182/64 The Snowdog - Fir Trees. Kit includes DMC 6 stranded cotton, chart and instructions, 14ct iridescent aida and needle. DMC Tapestry Kit - The Hare by William Morris - V & A Museum Collection. DMC Tapestry Wool. DMC have collaborated with the V&A to produce this wonderful range of tapestry kits. Printed Canvas. The delicate water-colour shading of this range of kits has been developed from paintings by Lisa Audit. DMC 6 stranded mouline 40 colours on organiser. 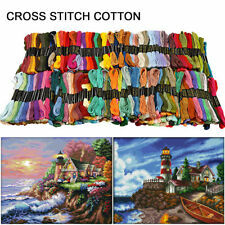 These kits will give the seasoned needleperson a more challenging counted cross stitch project. The Kiss is an oil painting painted by the Austrian Symbolist painter Gustav Klimt between 1907 and 1908, during the height of his ‘Golden Period’. Sufficient DMC 6-stranded mouline to complete your project Chart and instructions 14 count aida Needle. DMC Counted Cross Stitch Kit Gustav Klimt - The Kiss BK1811. Your kit includes: DMC 6 stranded mouline on a thread organiser, chart and instructions,14 count white aida 45 x 45 cm, needle. Counted Cross Stitch. Nuevo anuncioKit de Bordar DMC Flora & Fauna arte no 219.244 tamaño 70 X 85cms paquete Sellado! nuevo! DMC Navidad puntada cruzada contada Kit "The Snowdog-es nieve"
This is a DMC Counted Cross Stitch Kit "It's Snowing" from the gorgeous The Snowman and the Snowdog Range. "It's Snowing". Cross Stitch kit by DMC Classics. Kit contains - Linen, threads, needle and instructions. Very un-usual kit - and it does say for the more advanced. DMC ~ Counted Cross Stitch Kit ~ Farm Garden with Sunflowers. DMC threads on organiser. Your kit contains Finished Size 28.5 x 28.5 cm. DMC Cross Stitch Christmas Mini-Kit "The Bauble". This policy enables us to reduce costs to an absolute minimum and preserve the most competitive prices. We are cautious to re-examine all products prior to dispatch and hope that you are satisfied with the quality. Counted cross stitch kit with Lillies design. DMC stranded cotton. The kit was donated to the charity for sale. The kit is unopened and unused. Zweigart 14 count aida fabric. As seen in photo. CONTENENTE 100 FARFALLINE AVVOLGIFILO. CATOLA PORTA MATASSINE MOULINE' DMC O MILWARD : 28x18x4 cm. Sin abrir. Varios temas. 6 Kits de punto de cruz. Se realizan envios combinados. No nos hacemos cargo de las posibles tasas aduaneras. The popular tatty teddy is printed onto a 14 count white aida, you then simply stitch the motif. Kit contains: 14 ct white printed aida, DMC stranded cottons, needle and full instructions. 'Lunching & Knitting' - Number BK1568. Cross Stitch kit by DMC. Really cute picture of 2sheep - knitting & eating lunch! Kit contains - Aida, threads, needle and instructions. DMC ~ Cross Stitch Kit ~ Rainbow Seeds Flowers V. DMC threads on organiser. Your kit contains Finished Size 14 x 15 cm. Techniques - cross stitch and backstitch. William Morris - Strawberry Thief. Inspired by the V&A. Made By DMC. Embroidery kit. There is a cut out on front of kit but has not affected the kit. The kit is new and sealed. DMC BK1793 Rose Ball Printed Cross Stitch Kit. Kit includes DMC 6 strand Mouline and Etoile thread, 14ct printed aida, chart & instructions and needle. This kit is a printed cross stitch kit, no need to stitch black brush-work, just cross stitch the fabulous frock! DMC BK1669 On Dad's shoulder Cross Stitch kit. designed by Jayne Netley Mayhew. Kit includes 16ct aida, DMC stranded Cotton, charts and Instructions. DMC ~ Half Cross Stitch Kit ~ Pink Geo Flowers. DMC threads on organiser. Your kit contains Finished Size 20 x 30 cm.